Another Nonie Creme Colour Prevails review! 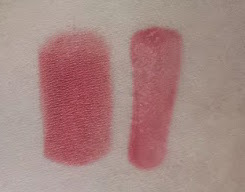 I own the brand’s Classic Lip Duo (lipstick and lip gloss) in two shades, Vintage Rose (review here) and Neutral Pink. I think I’ll be using Vintage Rose even more often in the autumn; lately, however, Neutral Pink has been getting heavy rotation in and out of my bag. Here is it closed, with Nonie Creme’s signature butterfly-wing motif. And here’s the lipstick end of Neutral Pink. As you can see, that name isn’t quite accurate: this shade is really more of a coral-tinged rose, very fresh and a little bit retro. The lipstick has a smooth, slightly slick finish. It’s medium-weight and gives full coverage and excellent color payoff even in one swipe. And here’s the gloss, which is identical to the lipstick shade. It feels light and a touch slippery, but again, it has an intense dose of pigment (especially for a gloss). I’ve worn these two formulas alone and together for different looks this summer. The color feels cheerful and summery, although it may eventually look too warm and bright against my paler, wintertime complexion and winter wardrobe. The colors actually look slightly too brownish here, in diffused light; they’re really more true to the color you see in the tubes and the photos above. However, this shot does give an idea of the coverage—I swiped each product once on my wrist. Basically, the “pros” of this Lip Duo in Neutral Pink are the shade, the moisturizing feel of both products, and the generous color payoff. The one “con,” for me: if I wear this duo over lip balm, it starts slipping off my lips after a couple of hours or a drink, requiring occasional mirror-checks and touch-ups. Still, this item is a pretty and playful lip color option, and it’s made me happy every time I pulled it out of my purse this summer. All photos by Tinsel Creation. Product source: I purchased this item at Duane Reade. Nonie Creme’s Colour Prevails collection is available at Walgreen’s (and Walgreen’s online), select Duane Reade stores, and Drugstore.com.